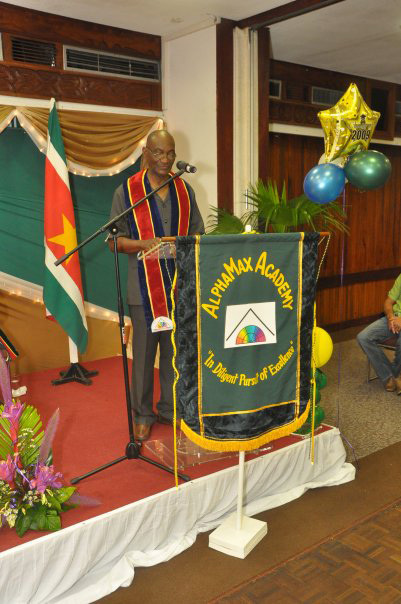 The Academy was founded and established in Suriname on September 1st, 1998. From the inception, there has been a strong emphasis on academic excellence – and the directors of the fledgling school chose to enshrine this idea not only in the school’s motto, but also in the method of teaching– small classes where students are guaranteed individual attention in a highly interactive academic environment to ensure quality, good student retention, and an insistence on good performance on internationally-accepted, external examinations. The AlphaMax Academy is a values-based institution of education with an international curriculum that is delivered in English. The academic program ranges from kindergarten through high school (K – Grade 13), and focuses on the cultivation of critical thinking, and the acquisition of solid, classical foundational knowledge and learning skills. The Academy is run by the Directors of the AlphaMax Foundation, who, with a dedicated, experienced, and qualified team of teachers, provide high-level, qualitative, individual attention and teaching to the student body. Academy Scholars reflect the school’s high standards of excellence in several ways: First, in their scores (in the top 1 – 5% worldwide) in international examinations; and second, in the fact that high-school graduates have been invited to, accepted at, and perform admirably in leading universities in North America, Europe, Asia, Latin America, and the Caribbean. The Academy is governed by the Board of the AlphaMax Foundation. In addition to the Board of Directors, which oversees the Administration of the Academy, the Board of Trustees reviews and confers Academy diplomas.